Little Foot went to bed quite early tonight. As always, she has would still wake up and cry on and off. Tonight, I remark to Daddy Long how her hair smells like biscuits… the oh – so – familiar smell of my baby… I can’t help but smell a few more times. Earlier today, I went back to my workplace to have a quick chat with my new supervisor. Time has flown by. Five weeks left to my return to work. Little Foot will be almost 11 months by then. Even as I start preparing myself to return, I know even at the 11th hour, we will not be ready. Which mother is ever ready really? A part of me don’t want to stop latching because time is running out. Another part of me (the rational one) tells me I should at least get her used to regularly using the milk bottle again in the day time. Sighhh…. I will really miss my biscuit-smell baby when I am back at work. Separation anxiety is real. And it applies to mum and baby equally. Where has all the time gone?? I will miss all the lame “we are so bored at home, let’s take a wefie” moments with her. Yet even at such low moments, I must remind myself that I had 6 months more than most of my mummy friends to spend with my little one. I hope the bond we’ve built in this time will last us a lifetime. I really hope so. Little Foot has been sleeping since slightly after 8pm , waking occasionally as usual to latch (mostly for comfort). Awhile ago, in the wee hours, she woke up, flipped around and went back to sleep. And then she let out a clear “Maaa…” in a contented gentle voice and a smile on her face, still asleep. I just experienced bliss like no words can describe. Glad you are dreaming sweet dreams of me tonight baby. I unexpectedly spent three weeks at home with Little Foot without our helper who went on home leave, and this gave me a lot of food for thought (although no bandwidth to pen them). What I learned in my short term of being a SAHM without help really prompted me to write this to give my permanent SAHM friends a pat on the back. You know those photos of all those Hollywood stars like Angelina Jolie and our dear Princess Catherine spotted by Paparazzi all glam and chic and in control? Forget it. I didn’t even find time to style my hair (no way, you said?). Some days I’m looking half-mad/half – asleep walking up and down the corridor outside our unit rocking Little Foot incessantly in a carrier. I don’t understand the whole rationale behind why my helper rolls up the playmat (which weighs a bloody tonne!) everyday, sometimes more than once. Maybe over the years my mum has really drummed in the whole idea of how there must be a semblance of neatness (so all mess are hidden). I was happy to leave the mat and toys there. We go for a nap or a walk, we come back and I plonk Little Foot down on it. Afterall, the safest place is the floor now that she is quite a crawler and roller! Dealing with a baby who has separation anxiety, needs to be bathed, fed and entertained while my back killed me and I also need to eat and drink to stay alive and provide milk already made me feel like I need to clone myself. So please, never judge a mama whose house is messy. Rather use the make sure you didn’t feed your child a shoe and make her wear her cereal than try to pack toys which she will unpack in a blink. Just prioritise. 3. It takes a village to raise a child. I know it sounds cliché. It’s not. It’s a fact of life. In the second week as my back and stomach pangs deteriorated, and I start needing to catch my breath just washing a sippy cup, my siblings and mother, in addition to Daddy Long threw me a lot of lifelines. They checked on me via Whatsapp and calls. My bro-in-law and popped by to just help me carry Little Foot for awhile the one day I was afraid I wasn’t going to be ok, and my younger sister popped by to help out the next day. Daddy Long took many pockets of leave to chip in too. The best was my mum who took leave to accompany me and even cleaned and cooked. 4. It is okay to ask for help. At first I was all fine and dandy, so the first week was all cosy rosy and Little Foot and I had a lot of fun bonding. Then as my back worsened and I started to worry (with scary images of me collapsed somewhere while my helpless baby crawled around and bawled her eyes out) about us being home alone, it took a lot for me to open my mouth and ask for help beyond the husband. I beat myself up about it. All the “other mummies have been doing it, why I am so cannot make it?” self-reproaches playback in my head. On repeat mode. And then I had to admit to myself I am not them. I have medical issues. I cannot be superwoman. And so I asked and it wasn’t so bad. I love my family and we are very close. Isn’t that why mummies want more than one kid? So you can lean on each other? I asked and they rose to the occasion as they always have for me. 5. Never let others decide how to deal with your child. Three weeks I spent with my temperamental girl. I asked myself what went wrong. 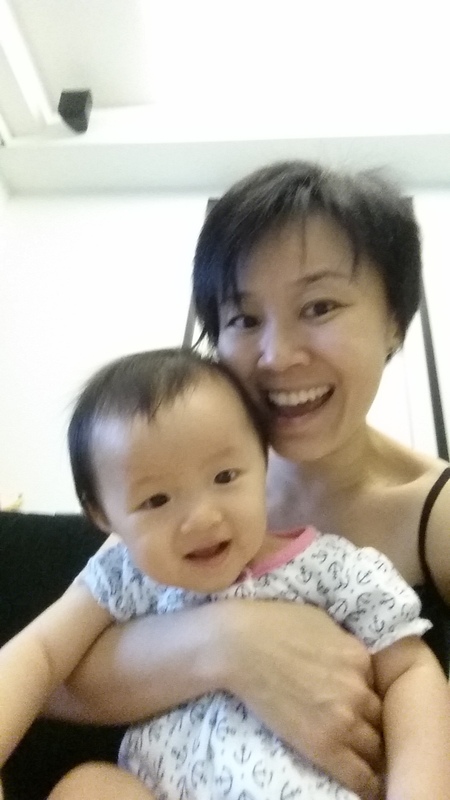 I blame myself first… I carried her too much from birth (stupid colic!) And I continued to indulge her even after the colic had gone away. I also allowed my helper to respond faster than The Flash whenever Little Foot so much as squeaked, and I didn’t think all the chattering to her was wrong. The result? My 9 month old doesn’t know how to self- soothe or self-entertain, fear separation and fear pockets of silence. Now this meant I have to talk to her, sing to her, and make eye contact ALL THE TIME. (Someone pass me the Woodbridge admission form please). So in these three weeks, we practised delayed gratification (Daddy is more firm on that one while I cave in a lot more). I made sure there was quiet time (it’s ok to let her sit and bite her toys while I stone and space out beside her), More importantly, I made sure of MEANINGFUL interaction. I pose questions to her like “What’s that sound?” And I provide replies and explanations about things “oh you hear that thunder? It’s going to rain! Rain is good as we all need water to drink…plants can grow, and then provide us with oxygen…” . We read books, and I sing her nursery rhymes and songs. I also spoke to her like a friend about my feelings. Some days she sat there wide-eyed and quiet when I felt down and emo. Yes, babies do feel and connect with mummies like that. 6. Things don’t always turn out the way we plan. Never mind Plan A didn’t work.. Plan B, Plan C fails too. That is motherhood. It’s like how I attempted to bring Little Foot out for a walk more than twice. That day she spent pushing hard stools out the whole day…Each time we were supposedly ready, she would suddenly need to push something out. Crap… All plans are put of the window! I think this applies to the current care giving arrangements too. Just need to keep adapting. 7. Mummies, we push ourselves too hard. I babywear Little Foot a lot. Too much. I lose good sleep because we co-sleep and she wakes for milk a lot. I spend her nap times thinking of her diet (what food to intro next) and how to make her bowel movements smoother… or what educational toys or baby gear to buy next. Still not enough. And then I unconsciously compare with the other mummies who look like they are doing fine. And want to do more. So I guess I deserve to have my brought on my lower back pain (old injuries plus a curved spine that too epidural), gastric pain and breathing issues. At times, I need to check myself on the self-reproaches and just sing “Let It Go”…. play boo boo saliva with Little Foot and just giggle mindlessly with her. 8. Don’t belittle Daddy’s role. Without Daddy Long, I would have gone off the rails on my downward spirals. Without Daddy Long and all the leave he took to help out, I cannot imagine how life would be when I cannot do so many things and really just want to lie down and rest inside of hang the laundry. He gave me a lot of extra time to sleep by bringing our little girl our for walks. And still had to endure my nitpicking, and listen to my fears (and my last words when I get all melodramatic). Motherhood is always a work in progress. See, 34 years on, my own mum finds it her responsibility to come and babysit me and my baby. I know she lost sleep worrying about me again. Not a vocation for the faint – hearted. So, to my full time SAHM friends who have been coping alone, I don’t know how you do it, but you have my respect. 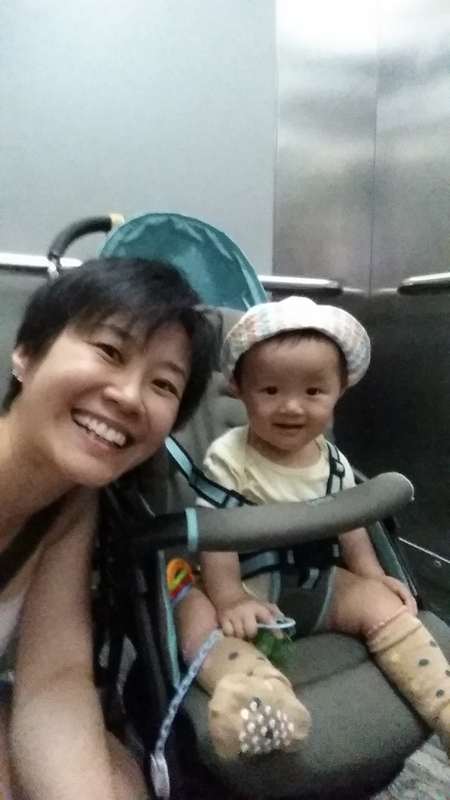 Now that our dear helper is back, I can go back to my sane tai-tai sort of SAHM life again, but it won’t be the same anymore, because I now need to make sure the bad habits are kicked before I go back to work in 1.5 months’ time. And oops…we both have greater separation anxiety now after having only each other to cling onto for so long. These three days have been particularly trying. I wasn’t sure which part of my body was the root cause – my back ached, my tummy felt strange, I couldn’t catch my breath, and at some points I just wanted to lie down depressed and hope that was my last breath. Grateful for family for throwing me several lifelines. They took turns to appear to help me with Little Foot… not easy because everyone has their own kids and are working. I’m currently lying down with one koyok on my back. Earlier this evening we went to Ma Kuang at Toa Payoh Central for TCM treatment. Super happy that the acupuncture (either electric currents) gave me immediate relief on my back. Also got four days of medicine till my next visit. This whole episode really got me thinking about how I don’t have backup plans. .. and whether the current arrangements work. Sighh… I’m no super mummy… and I feel guilty that I think of offloading my child to others, yet the reality is I cannot do this alone unless someone can miraculously fix me. Yet I don’t want to ever be held ransom by my circumstances. Need to think harder and deeper. Really, is this the best for Little Foot?